Our unique Kyoto walking tours delve into the fascinating history and culture which makes the city so enchanting. Step into the world of geisha, old tea houses and exquisite shrines, try zazen meditation or discover the city's incredible food scene. Marvel at the autumn leaves from a hidden forest temple, get lost amongst the cherry blossoms in a quiet park or sample the finest sake in a hundred year old backstreet bar - it's all here! 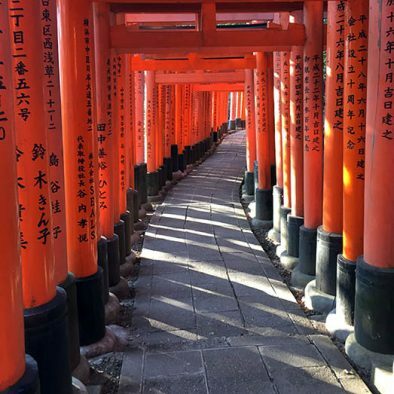 We've designed an extensive range of exclusive guided walks to showcase the many charms of Kyoto and its surrounding areas. Whether you're a family, a couple, a group of friends or travelling solo, our private tours can all be customised to suit. Let us know your interests and our expert guides will help you discover the real Kyoto, just like a local, while gaining a deeper appreciation of the city, its rich heritage and its people. With magnificent mountain ranges on three sides, Kyoto is blessed with some stunning nature on its doorstep which has influenced the area's shrines, gardens, festivals and arts for over a millennium. From strolling the city's ancient streets to exploring remote temples nestled deep in the hills well off the tourist trail, our guided walking tours reveal a side to Kyoto very few get to experience. View our collection of unique private walking tours below - there's something for everyone!